OUTR's Rosalea Monacella will be speaking at the upcoming ArchiFest '10. This years forum in Singapore will run in e from the 3rd to the 31st of October. This years themes explore the possibilities of developing cities into apparatus for ‘Happiness’ - an often elusive but a quintessential component of human aspiration. 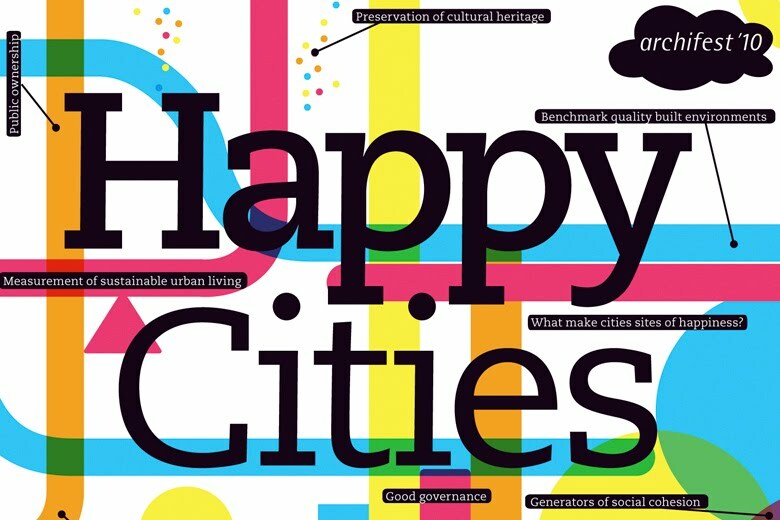 “Happy Cities” postulates a more refreshing way to benchmark quality built environments and sustainable urban setting. With pressing issues of the environmental upheavals, extensive inequality, proliferation of slums and depletion of natural resources, what parts can the urban and architectural fraternity play to engineer “happiness” in these trying conditions? How can we pursue this new index of urban living in a commercially domineering climate that propagates idiosyncratic or iconic, rather than social aspirations in architecture? How can urban spaces and buildings be generators of social cohesion, with positive contribution to community and built environment? Through a collection of built and speculative architectural and urban projects with varying socio-economical, political and cultural conditions, Happy Cities sets different yardsticks and definition of sense of place and spaces, to challenge conventional notion of sustainable urban living. Offering a glimpse of the bold new world that awaits us, ArchiFest proposes our measures of happiness, and share solutions, even utopian ideals to continue the development of our cities as sites for thriving and sustainable urban, cultural and social life.